- Dunsmuir, CA to Lassen Volcanic Nation Park - 1 night in the "Little Yellowstone"
We covered nearly 2500 miles, and pitched our tent nearly every night while on the road. Although we've seen a lot of Oregon, there's still several drives that I want to do next year including Hells Canyon and the Steens Loop. It's now officially a tradition. 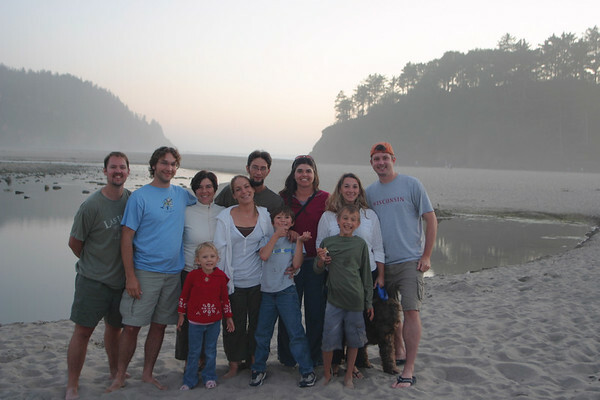 For the second year in a row, the fam descended on the Oregon coast for a weekend at the beach. The weather was great, and at times felt more like Mexico than the Pacific Northwest. This is the entire crew (thanks to Michele for suggesting that we take a group picture) in the evening enjoying a campfire, some local pizza and a few drinks. Already looking forward to next year. 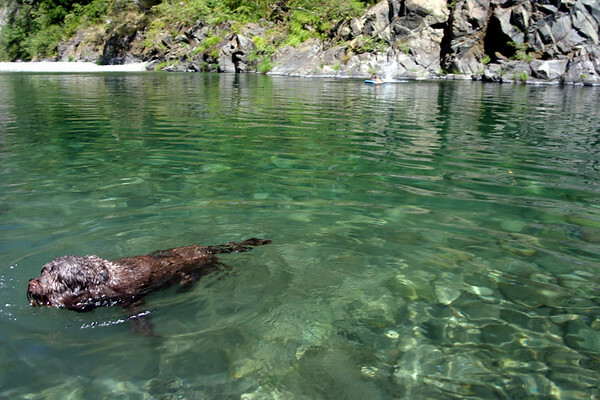 We had intended to hike to Turtle Island, a famous secluded swimming hole along the Smith River. It was supposedly and "easy" 2 mile hike. We found out that Easy is all relative. Kids, dogs, sandals, beach stuff, and other things can sway an Easy hike into the most miserable experience of your life if you're not careful. Well, we unfortunately found out the hard way, and after Niko's fall that drew blood, we decided to turn back. Beaten, but not defeated, we found another "secret spot" along the road and went down to the river to cool off. Captain bolted in to cool off and showed off a bit of his "portugese water dog" side. The Smith River really draws you in. 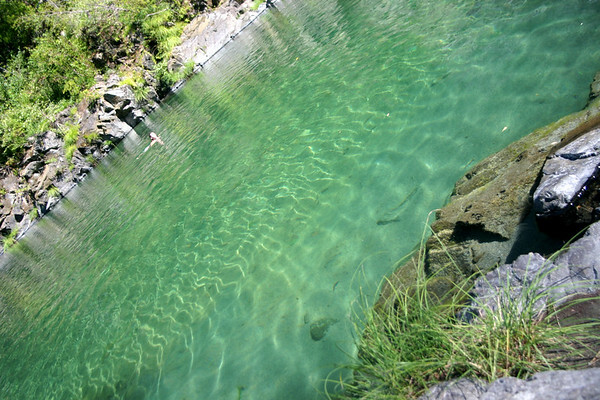 The water is crystal clear and the perfect temperature for a hot afternoon. Oneea is seen swimming in the distance. Back for a second year to visit our Redwood friends. 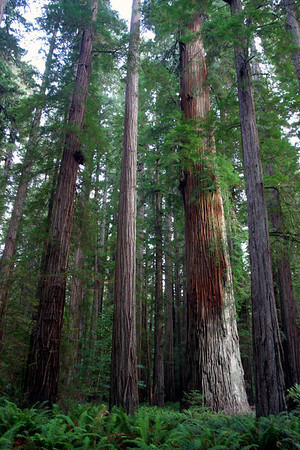 This is a group of massive trees located in Stout Grove. Many of the protected groves in the area have excellent, level trails where you can walk among the giants. "The human lifetime is a blink of an eye to these trees" It's hard to believe that only 5% of the original Redwood forest remains. And of that 5%, only 17% is protected. That means that less than 1% of the redwoods is currently being preserved for future generations....People have found other uses for Redwoods and for the last 100 years have been cutting at a feverish pace. These amazing trees which are thousands of years old have been turned into patios, decks, Gift Shop knick-knacks, picture frames and plaques. Is it really worth it? 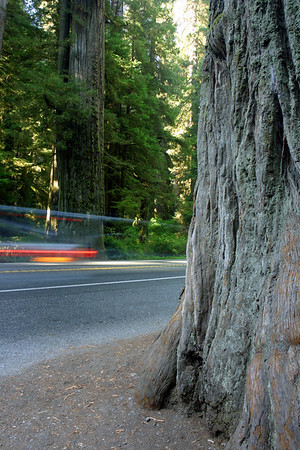 Drive to Northern California and see for yourself...I think you'll come away with the answer. So we're driving through Redding, California when Oneea decides to see if there is an In and Out Burger in the town. A quick check on the Blackberry confirms her suspicion. We deviate from the road trip plans and head straight for the true California dream. It was so hot outside (104°F) that we were forced to eat outside so that Captain didn't have to sit in the car. 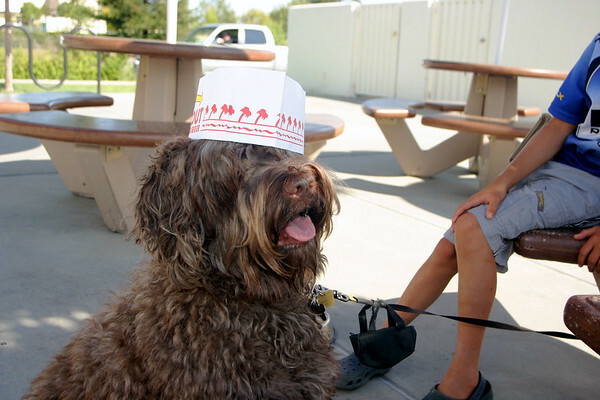 Here he is selling out to the famous burger joint (Captain would do anything for just one tasty bite of In and Out Burger). This was our first fast food experience in quite awhile (we gave up fast food as a new years resolution in 2005 and haven't gone back since), and wow did it taste good! 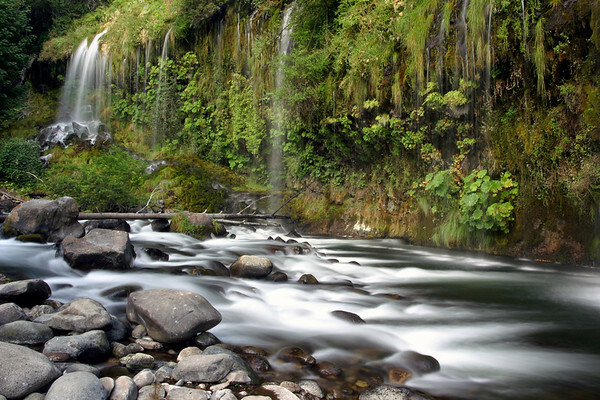 Another "easy" hike in Dunsmuir California leads you to Mossbrae Falls. We really did think this was going to be easy, until we realized that the trail is right beside the railroad tracks. This presented an interesting mental challenge considering there were some narrow, steep sections of trail where there wasn't very much room to dodge the train. But, we figured that we'd hear the train from miles away and have plenty of time to move out of it's way IF a train did happen to pass by. Well, as it turns out, a train did come, and we had ~10 seconds of warning before it roared past us. We were able to duck along the steep embankment and watch as it lumbered by. After the train passed, we quickly walked the last half mile to see the falls. They're beautiful, and we would have liked to stay longer but the light was dwindling and we still had to hike back. It's interesting how when I look at this picture, I think of loud trains. 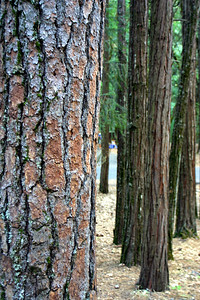 Really gives credence to the saying, "it's not the destination, but the journey..."
A stand of trees near our campsite. I don't know the name of these trees, but they're all over the Shasta region and have a beautiful orange bark that differentiates them from other trees. On this day, we decided to visit McLoud Falls for the day. We hiked to Middle Falls, drove to Upper Falls (Niko caught a fish), and then stopped to swim in the river just above Lower Falls. We had just pulled into Lassen Volcanic National Park and were driving towards a campground when we noticed the pink and red sunset illuminating Mt Lassen. We quickly pulled over to grab this picture before the last minutes of light went away. 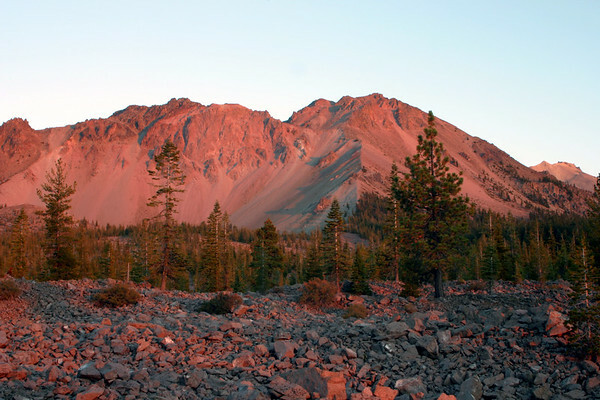 Mt Lassen is part of the Cascade range and last erupted in 1915. The area is still quite active, and there are lots of volcanic features to explore within the park. 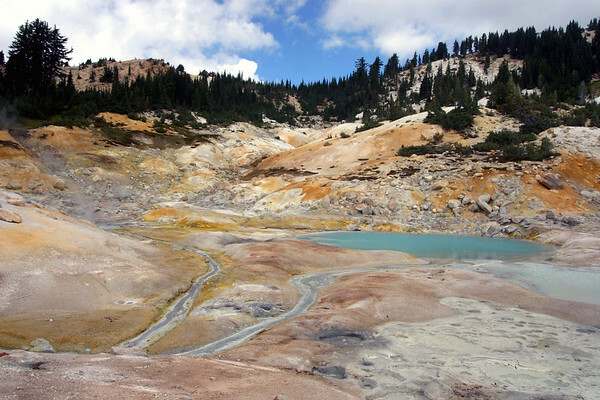 Bumpass Hell in Lassen Volcanic National Park. Colorful and smelly, this is one of the most active volcanic areas in the contintental US. There are boiling pools, boiling mudpots, and sulfur deposits all in this small area that's only a 2 mile hike from the road. No joke, but the best Fish and Chips that we've ever eaten is in the landlocked town of Sisters, Oregon. 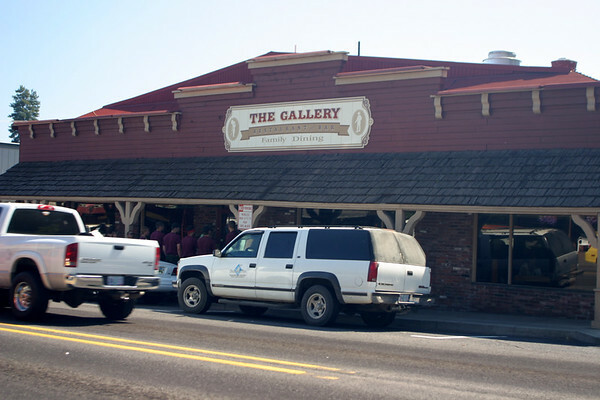 The Gallery restaurant is a must see if you're driving through Oregon. We've gone hours out of our way just to make a pit stop at this restaurant. 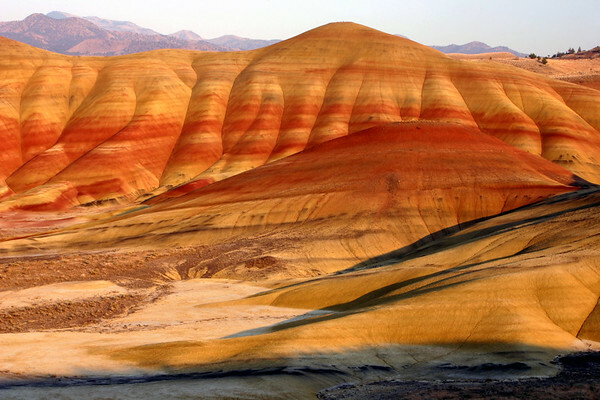 "Remember it ain't too late to take a deep breath and throw yourself into it with everything you've got...It's great to be alive" - Drive-By Truckers The Painted Hills are a must see. Beautiful, calm and simply put, an experience that makes you feel alive. 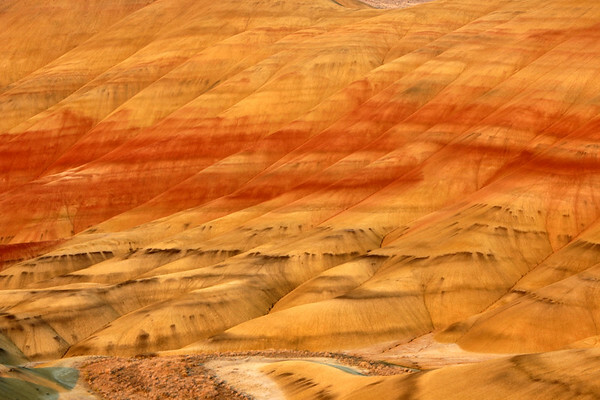 The Painted Hills at High Noon. 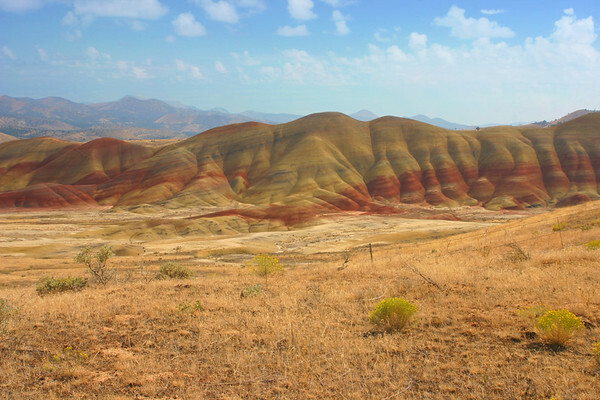 We spent our final day of vacation driving and hiking in and around the Painted Hills. We found some incredible "hidden spots" and some really interesting mountains along the way. But when it was all said and done, there's still no beating the viewpoint where most people stop to visit. After living in lush green BC for 3 years, the high desert of Oregon is such an interesting landscape and welcome change.